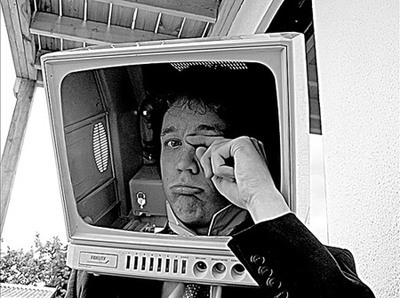 April 23-29 is TV Turnoff Week. The Center for Screen-Time Awareness sponsors this week every year. Though it's aimed to get children a break from too much TV time, I believe adults can benefit from this, too. And writers? Oh, yes. If you don't have enough time to write, yet watch hours of TV each night, this week is a gift. Keep the TV off during those prime times, work on any writing/creative project instead, and see what you have at the end of the week. Because I don't watch TV anymore, I'm way behind catching up on good shows. Friends and relations have been recommending "Da Ali G. Show" for ages, so we finally rented a season. I can't remember when I last laughed that hard. In this clip, Ali G., brainchild of comedian Sasha Baron Cohen, interviews Noam Chomsky (yes, THAT Noam Chomsky), linguistics professor at M.I.T. And they discuss language. I'm amazed at the patience of some of Ali G.'s famous "victims." Despite being called "Norman Chompsky" in Ali G.'s intro, the linguistics genius puts up with Ali G.'s ridiculous questions and assertions and gives a whole-hearted interview. Also, Ali G.'s repeated grammatical slanderings seem not to rankle Chomsky in the least. Now that's composure. Jon Lovitz! He's the TV character — acting as an obnoxious, over-the-top version of himself — from Saturday Night Live. Jon Lovitz: Hello, I'm Jon Lovitz, and I'm having lunch in the Russian Tea Room with the most beautiful woman in the world — Paulina [Porizkova]! Well, we can't all be me. But if you'd like to fulfill your dream like I did, then I have one piece of advice for you — Get To Know Me! When did I chip my tooth? Why do I drain my foot? Where is my extra bone? Get To Know Me! Got to go — listen to him! Don Pardo: Hello! Before I got to know Jon, I was nothing, nowhere, nobody! I was stuck in a room reading voice overs I could barely understand! And then, I got to know him, and now I get to be on TV! And today, they call me... Don Pardo! Jon Lovitz: Get To Know Me! Why do I never wear a hat? Why was I banned from Bangkok? Why do women call me "The Anchor"? Read the rest of the skit here. Wondering what this is about? Read my original post. After receiving comments that my blog's "About" section said almost nothing about my projects and experience as a writer, I've completely revamped it. If you'd like to read it, you're welcome to click on the ABOUT link at top of left-hand column or click here. I'll give a shout-out to anyone who can tell me which TV character is famous for saying, "Get to know me!" I'll post the answer — and any winners — tomorrow. This is THE END, my TV friend. 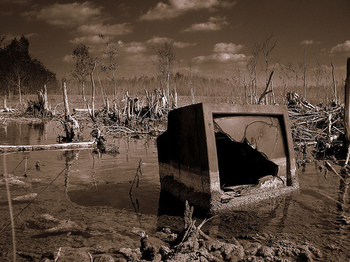 I've blogged before about how I don't watch TV anymore and don't miss it in the least. Many friends and relations think I've been brainwashed by an anti-TV cult (a.k.a. National Public Radio, from their viewpoints). A small faction of my TV-addicted chums are trying to convert me to the Church of TiVo so they can talk with me about our favorite shows again (sniff, sniff, sob). I politely remind them that "Melrose Place" and "Seinfeld" haven't been on in years, and there's just no going back for me. I ask, "Ever seen 'Kitten Composer' on YouTube?" Their response is silence. 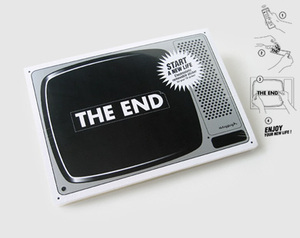 Thus, this electrostatic TV sticker from Atypyk (pictured above) makes me so gleefully happy. 1. Image of a hand turning TV OFF via remote control. 2. Image of hands peeling sticker. 3. Image of hands placing THE END sticker on TV screen. 4. The following words: "Enjoy your new life!" I'll be purchasing about a dozen of these. Thanks to swissmiss for finding this simple, powerful product. If you haven't read The 7 Habits of Highly Effective People by Stephen R. Covey, now might be a good time. "On a final personal note, I want to repeat a question I constantly pose in my teaching: How many on their deathbeds wished they'd spent more time at the office—or watching TV? The answer is, No one. They think about their loved ones, their families, and those they have served." Since my formative TV years were the 1970s, I grew up on claymation. I watched the adventures of Gumby and his horse Pokey, riveted, thinking, How do they move around like that? When I first saw the Rankin/Bass Studios' magical Rudolph the Red-nosed Reindeer, some part of me swore I would become an animator. Somehow. Someday. "iStopMotion is the ideal supplement for your Digital Hub. Used by educators, professional and amateur film makers all over the world to create astonishing work, iStopMotion is the tool of choice for Stop Motion Animation (aka. Claymation) and Time Lapse Recording." The site touts its educational and professional uses. But here's what I'm thinking: ACTION FIGURES! Our place if FULL of them. And we've got vehicles, too. Trucks. Planes. Boats. And stuffed animals! Wow! Let's put it this way: when we've somehow managed to organize every toy we own into a rousing rendition of the Village People's "Y.M.C.A.," I'll post the stop-motion video here first. And here's video of David Pogue, famed New York Times technology columnist and blogger, and his family demonstrating their newly acquired animation abilities thanks to iStopMotion. I don't watch TV anymore. I don't watch TV anymore. Neither does the rest of my family. We watch DVD's that we choose — only. We don't have cable or a satellite dish. We don't get a signal. We don't see commercials on TV. We get our news from websites, newspapers, the radio, word of mouth. If I still watched the same amount of TV now that I used to years ago, I wouldn't have time be with family and friends, sleep, eat, exercise, work — and blog. Something had to go, and we chose TV. I'm not anti-TV, and I'll happily tune back in for things that I like: the Olympics; the World Cup; other meaningful, interesting, signature events. I wonder how many other bloggers out there are in this similar, new-media situation.